It does make you wonder if the US executive has an ulterior reason for pursuing military action so vigorously in Syria. When direct intervention is unavailable, intervention by proxy becomes necessary. They have of course many other reasons for wanting to intervene in Syria other than their stated reasons of humanitarian aid and securing Assad’s chemical weapon stockpile. Syria is a key regional player in the Middle Eastern chess board. They are Iran’s main ally and a thorn in Israel’s side having twice been to war with the Jewish state and main protagonists and enemies since 1948. The present Syrian state is historically an ally of Russia since the days of the soviet empire. The Syrians were provided with arms and a military alliance, and in return were provided the Soviets with a naval base in the Mediterranean. Many soviet military personnel were stationed in the country and over a period of 40 years there was a lot of inter-marriage. Russia doesn’t use the naval base anymore but cultural ties have grown between the two countries. President Assad and most of his government belong to the alawite shia sect. Therefore they are also a natural ally of the shia Iranian state. The alawite shia control Syria despite the fact that sunni muslims make up the majority of the population. The current civil war which rages in Syria is much to do with the Sunni majority attempting to break the alawite control of the country and form their own sunni state. For this reason alone, the Syrian civil war has the attention of many of the regions muslim states. There is an ongoing sunni/shia power struggle in the middle east in a similar vein to the cold war. The two main protagonists are the sunni kingdom of saudi arabia versus shia Iran. Turkey and most of the gulf arab states are aligned against Iran. This is not a religious schism war, those were fought out centuries ago. This is a clandestine power struggle over the hegemony & leadership of arab and muslim states. The sunni states blame Iran for funding dissident groups and agitating grievances among the shia populations in their countries. They blame Iran for creating the ‘arab spring’ dissent in Bahrain and Yemen. Iran on the other hand accuses many of the sunni states and particularly Saudi Arabia and Qatar as being complicit with the Americans in plotting against Iran’s strategic interests. These interests are Iraq, Syria and the Lebanon. The oil & petroleum business is also very much at the heart of this dispute. There are many competing geopolitical interests concerning oil and gas pipelines in the region. Oil & gas pipelines are not just prohibitively expensive to build and maintain but also make up the network infrastructure of export and delivery systems that connect the supplier with the consumer. In the pipeline business there is not room for two competing pipelines to an end consumer. One must succeed at the expense of the other. Iran is embarking on building two ambitious oil and gas pipelines. The Iran-Pakistan gas pipeline travels from their southern Iranian oil fields through to Pakistan and on to India and possibly on to western China. Presently the Iranians are in the process of assisting Pakistan construct its section. It is due to be completed by Dec 2014. The other pipeline known as the ‘Islamic’ gas pipeline is to be routed through Iraq, Syria, the Lebanon and then under the Mediterranean all the way to Greece where it will connect to the European networks. It will be the longest oil pipeline yet constructed and the biggest ever construction project for Iran. 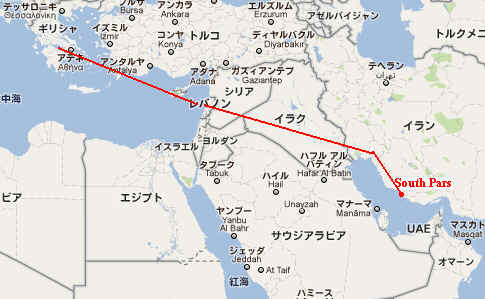 In the countries of there are however competing oil and gas pipelines designated for Syria, Lebanon, and Pakistan. American oil contractors have already built a pipeline network from the oil fields of the Caspian sea. They had already started building an extended route down through Afghanistan which was intended to pass through Pakistan and terminate in India with another extension reaching an Indian ocean port. This Trans Afghanistan Pakistan India [TAPI] was to be fed from the Turkmenistan gas fields. More precisely it was to source natural gas from the western petroleum corporations who are not allowed to export the natural gas through the existing Russian or Iranian gas pipelines that reach Turkmenistan. Russia does not want to assist these western oil corporations whom it believes took advantage of the collapse of the Soviet Union in 1991 to quickly move in to exploit the Caspian oil & gas fields of Kazakhstan and Turkmenistan. They have tried to thwart or hamper the fuel exports from these former soviet states ever since. Work on the TAPI pipeline had to be aborted when Pakistan rejected it in favour of permitting the Iranian pipeline instead. In 2012, the USA gave a direct warning of potential economic sanctions against Pakistan if it did not cancel its involvement in the competing Iranian-Pakistan gas pipeline. Pakistan gave a considered reply that it intends to complete its section of this pipeline regardless of any sanctions as it believes that it remains in the interest of the nation. Following this rebuttal, Saudi Arabia approached its fellow sunni nation Pakistan on behalf of the Americans with a generous offer of financial aid and another offer of cheap oil and gas supply by ship. This offer was rejected. It is believed that a better financial offer has been made to Pakistan by China. Many analysts predict that another extension of the Iranian pipeline will pass through Pakistan to the Chinese border. Here we have another reason why the USA does not want to see this gas pipeline completed. The USA is trying to restrict the supply of oil & gas to the fuel hungry China. The reduced supply guarantees that China remains fuel starved and has to pay a premium on its supply now and in the future. At the same time , the US is awash with cheap gas from its internal fracked gas production. It will be self sufficient in fuel by 2015. Therefore the US will be able to cut manufacturing and business costs due to cheaper fuel whilst China will have to factor in more expensive fuel costs to its economy. This is all part of a long war of hegemony and ring fencing of vital natural resources which at present the United states is winning. This is certain to slow down the Chinese economy and allow the US to remain in pole position. If Iran completes both of these pipelines it will end up having one of the most connected and dominant gas fields in the world supplying India, Pakistan, and India in the East at a unit cost much lower than its competitors. If the ‘Islamic’ pipeline in the west connects the South Pars Iranian gas field to Europe then Iran who shares the South Pars gas field with its enemy Qatar will be able to extract and sell the lions portion of this natural gas field. Qatar at present can only export LNG gas by ship which is more expensive per unit and with a more restricted demand. 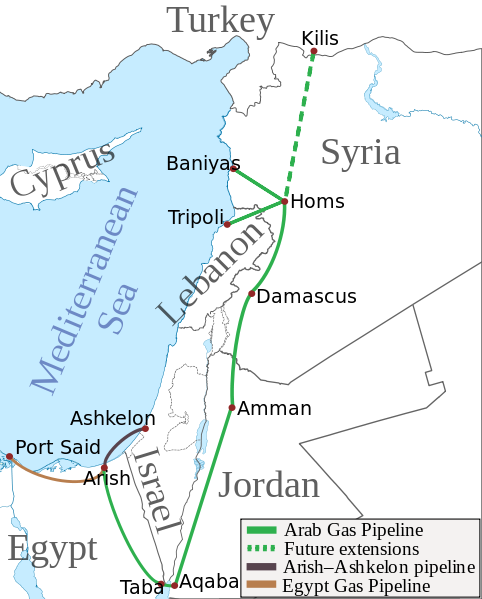 Another pipeline called the Arab gas pipeline was planned from Qatar passing through Jordan, Syria, the Lebanon, and on to Turkey. This network would be compatible with the pre-existing gas hub in Turkey from the Caspian producers. It would also possibly connect with a planned Israeli built undersea pipeline from the leviathan gas field in the Mediterranean, from Israel and on to Cyprus and then on to the Greek mainland where it would connect to a European consumer hub & network. Work has not started on the ‘Arab gas pipeline’ because President Assad will not licence it through Syria. Instead he has opted for the competing Islamic pipeline from Iran. In order for the American pipeline through Afghanistan to be completed and the Arab gas pipeline from Qatar to be built, there would need to be regime change in both Pakistan and Syria. Regime change in Iran could be seen as the ultimate solution to thwart Iran’s plans to open up european & asian markets for the gas it produces. The gulf states would see this as a preferred option in order to put a stop to further Iranian meddling and funding of shia opposition groups in their countries. Israel and the USA would of course of course see an end to Iran’s nuclear weapon program. Strategic analysts often state that regime change in Syria is a necessary precursor to regime change in Iran without explaining why this is so. This is more likely an Israeli strategic requirement for a military strike on Iran. However the defeat of Assad & regime change is a necessary precursor to a successful invasion of the Lebanon. Israel needs to secure its northern border in the event that it engages in a military conflict with a third party such as Iran. In the south, Israel has its new ‘Iron Dome’ defence system to protect itself from rocket and mortar attacks from Hamas in the Gaza strip. Hamas has also been substantially disabled by Israels recent invasion of the Gaza. However in the north, Israel is vulnerable to medium range missile attacks from the Hezbollah. They are an effective force that has proved that it is a match for the Israeli Defense Force [IDF]. They repulsed an Israeli invasion of the Lebanon in 2006, and are although this speaks volumes for the effective strength of the Hezbollah, Israel also had to retreat because it could not afford being bogged down in a prolonged Lebanese conflict and subject to a potential Syrian attack on its flank. Syria protects the Hezbollah. They provide support and a base for retreat for this Iranian backed Shia militia and government whom presently control most of the Lebanon. The Hezbollah in the Lebanon are effectively a proxy Iranian State. Iran provides over $1bn a year military & financial aid for them. The military supplies are passed through Syria. The Hezbollah are an effective well armed military force whose officers are often trained in Iran by the elite Quds Forces. Some of their officers are also officers in the Quds Force. Iran has requested that the Hezbollah provide a large contingent of soldiers to fight in support of President Assad in Syria. They make up the ranks of an expeditionary ‘shia foreign legion’ which numbers about 6000 and is also made up of Iraqi shia militias and a large contingent of elite Quds Force commandos. This unit has proved very effective against the Free Syrian Army in urban based combat. They have proved an effective hedge against the influx of foreign battle hardened insurgents from Libya, Tunisia, and Afghanistan who are fighting with the Al-Nusra militia whom are in a loose alliance with the Free Syrian Army [FSA] and the Kurdish militias. Without the support of this Al-Qaeda force, the FSA would not have been able to occupy and control much of the large corridor of territory in the north along the Turkish Border. This has enabled the FSA to export a small flow of crude oil across the border in exchange for essential supplies and money. Most of the other regional muslim and arab states are controlled by Sunni governments. Up until the fall of Saddam Hussein that also included Iraq. However after the American reconstruction of Iraq, the ruling authority in Iraq has become shia led and is becoming an effective satellite of Iran. The withdrawal of US forces from Iraq and the closure of US army bases there were influenced by the partisan views of the Iranian biased new government of Iraq. The security of these bases was also compromised by their situation in a general hostile environment. In the summer of 2011, the ‘arab spring’ spread to Bahrain and Yemen. While western media reported these ongoing uprisings as an arab spring fight aginst dictatorship and control as in Tunisia and Libya, in truth they were the result of a downtrodden shia majorities that felt that they were being not reresented and downtrodden by Sunnis who held tightly on to the reigns of control. The Sunnis authorities saw the hand of Iran funding dissident groups and provoking agitation among the shia populations. If President Assad’s Syrian Army along with the auxiliary shia foreign legion are defeated in Syria, then the whole political and economic map of the middle east changes. The first likely outcome will be a full scale Israeli invasion of the Lebanon. The Israel Defence Forces would be able to defeat the Hezbollah without the threat of a Syrian army crossing the border to support their Hezbollah allies. The Israelis would probably be careful to only attack Hezbollah targets so that they could still count on some Lebanese support from the Hezbollah’s rivals and enemies. Israel would want to benefit from a quick reconstruction of the Lebanon and the institution of a Israeli friendly government and military. As a carrot incentive, the Lebanon could receive much reconstruction finance from Israeli appointed oil & gas corporations who want badly to develop and explore the extensive gas fields that lay within the Lebanon’s territorial waters. One of the world’s largest oil and gas fields is slowly being mapped in the Eastern Mediterranean basin. Israel is opening up the large Leviathan gas fields which it discovered. The Dalitt and Tamar oil fields lay on its Mediterranean border with the Lebanon. Further gas and oil discoveries have been made offshore in the respective territorial waters of Egypt, Syria, Turkey, Cyprus, and in the Greek Aegean sea there are suspected large reserves of gas and oil. Israeli petroleum companies have discovered large gas and oil reserves off both the southern & northern coasts of Cyprus. They are currently drilling for gas and will eventually transport Cyprus’s natural gas through an Israeli gas pipeline which they will be constructing from the Israeli Leviathan field, through Cyprus and on to the Greek mainland. 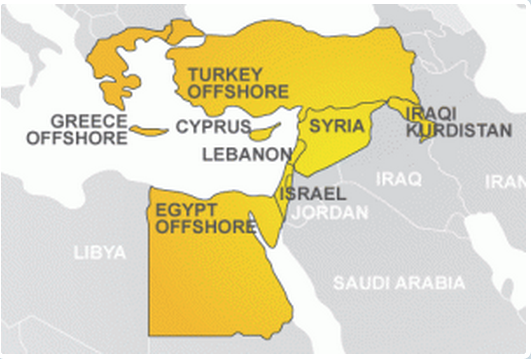 Israel wants to be the major partner in a multinational coalition of Eastern Mediterranean gas producers. It wants to lead in the exploration, exploitation and export of the natural gas to the European markets which should break their dependence up on piped Russian gas. If a reconstructed Lebanon free from the influence of the Hezbollah can learn to cooperate with Israel, then it will be allowed to join the membership of this exclusive club of potential wealthy gas exporters. ← Holography is the new Stealth technology.